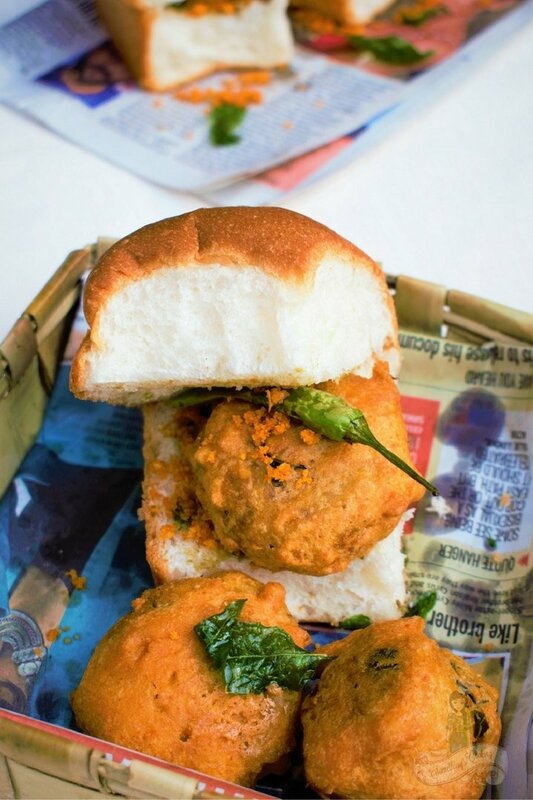 Vada Pav is a popular street food in India, especially Mumbai. It is the Indian version of a burger, a layman’s staple diet, where fried potato tikki is sandwiched in a pav (bun), spread with green and garlic chutney. You also serve fried green chilies with it to up the spice quotient. Vada Pao or Vada Pav is my husband’s favorite. I had it for the first time on my stay in Pune, a couple of years ago. Thanks to his job, he had already been to many parts of North India and had acquired a taste for it. While I can have one, or utmost two, he can gobble close to five Vada Pavs at a time. 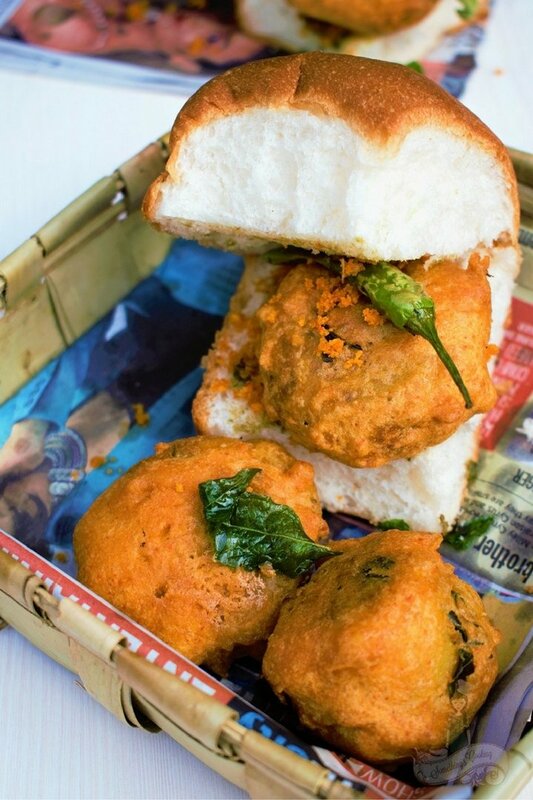 Vada Pavs can be had for breakfast, lunch or as a teatime snack. That said, have it along with Indian Masala Chai. Ha! Bliss! Never in my dreams did I think of making a Vada Pav at home. I always thought it was a tedious task because of the many elements in it – be it the Batata Vada, the green chutney or garlic chutney. Never knew it was a piece of cake, until today. I have used store bought Pavs (buns) for preparing this dish. Preparing Vada Pav involves three steps, mainly the preparation of the Batata Vada, green chutney and garlic chutney. Grind together garlic cloves, green chilies, and ginger. 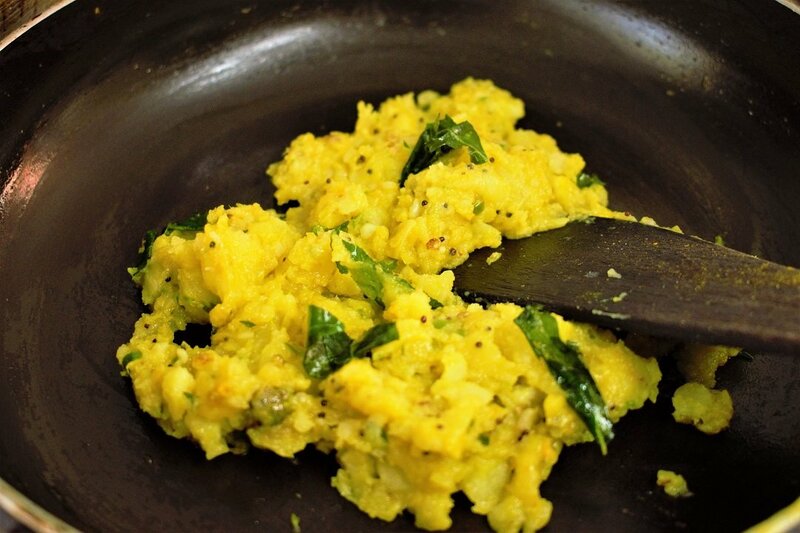 In a pan, heat a tablespoon of oil and add mustard seeds and curry leaves. Add the ground mixture and crumbled boiled potatoes. Add salt, coriander leaves, and turmeric powder. Mix well. Cool to room temperature and make balls out of it. Prepare a thick but flowing batter out of gram flour, red chili powder, salt, and water. Dip the ball in this batter and deep fry. Grind together coriander leaves, mint leaves, garlic, lemon juice, little water, and green chilies together. I have gone for the easy way for preparing this chutney. This would not be an authentic recipe, but I loved the fact that my friend shared this quick to do garlic chutney variation. Drop few drops of the prepared batter in hot oil. Fry and remove. Prepare about 1/4 cup of this fritter. Grind with garlic, salt and red chilli powder! Slit the Vada Pav and heat. Spread green chutney on a side. Sprinkle garlic chutney and place the Batata Vada and fried green chili. Serve hot. Prepare a thick but flowing batter out of gram flour, red chili powder, salt, and water. Grind together garlic cloves, green chilies, and ginger. In a pan, heat oil and add mustard seeds and curry leaves. Add the ground mixture and cook for about 30 seconds. Add crumbled boiled potatoes. Mix well. Turn off flame. Add salt, coriander leaves, and turmeric powder. Mix well. Cool to room temperature and make balls out of it. Dip each ball in this batter and deep fry. Grind together coriander leaves, mint leaves, garlic, lemon juice, little water, and green chilies together. Keep aside. Drop few drops of the batter in hot oil. Fry and remove. Prepare about 1/4 cup of this fritter. Grind with garlic, salt and red chilli powder. Keep aside. Slit the Vada Pav without breaking into two. Spread green chutney on the sliced side. 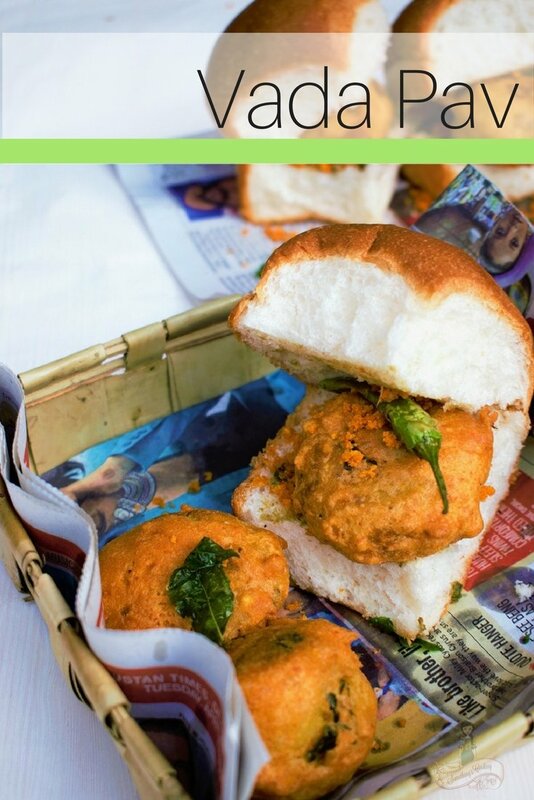 Sprinkle garlic chutney and place the Batata Vada and fried green chili, sandwiched between both slices of the pav. Do not ad more green chutney. It makes the pav soggy. I’m sure you’ll like many such Indian recipes – from chutneys to biriyanis. Subscribe by entering your email below and get an ebook of Indian recipes straight in your inbox. Your blog is always a pleasure to visit. 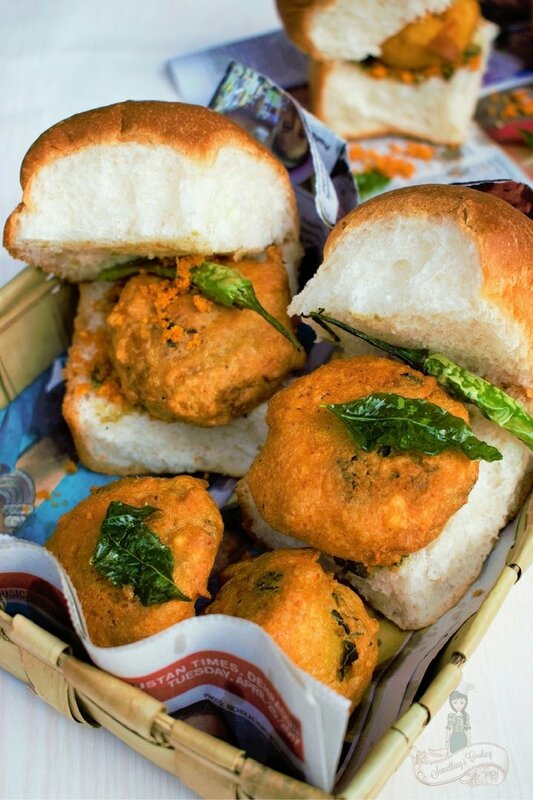 Vada Pao has been a favourite dish of mine as I like the spicy things more. Thanks for sharing the recipe. I will try this out soon. I love Vada Pav! And I miss my Mumbai ones!Your pics and presentation rocks, as always! Living in Mumbai for a good number of years, Vada Paav is now synonymous to me with a quick on- the- go meal. Thanks for sharing the recipe. This looks good, but we are trying to avoid deep fried foods. Can this be pan fried or baked?